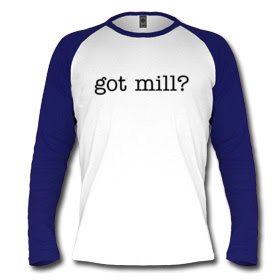 I Am The Mill: The Mill's Refer-A-Friend Drive - Win a Totally Sweet T-shirt!!!!!!! The Mill's Refer-A-Friend Drive - Win a Totally Sweet T-shirt!!!!!!! A shirt like this could be all yours. Just send your friends to my blog, and have them leave a comment at the end of this post telling me who referred them. Not kidding! Disclaimers: The shirts are made out of cotton. Cotton is flammable and vulnerable to strong acid. They are hypoallergenic except to those allergic to cotton - if you're allergic to cotton, I can send you a poncho made from a plastic garbage bag, but it won't say anything on it. These shirts will not insulate your body from sub-freezing temperatures nor can they be worn in the depths of space. That being said, the shirts will wick away perspiration during light to moderate physical activity. White shirts will become see-through during periods of heavy rain or rowdy horseplay with a garden hose. Additionally, I should mention that brown gravy will stain all non-brown shirts, whereas mustard will stain all non-yellow shirts. If you stain a blue shirt with mustard, the stain will appear green. No refunds, exchanges, complaints, etc. It's a free shirt. What the hell do you expect? Also, you'll have a choice of what you want the back of the shirt to read. Here are a couple examples, but I won't limit you to the following two choices. It's your shirt, after all. If there's a tie, then I guess you'll each get shirts. I don't know. I reserve the right to hold some sort of tiebreaker, but it might be easier just to send out an extra shirt. Whatever. I expect that you won't need to refer too many people in order to win, but the more the better. 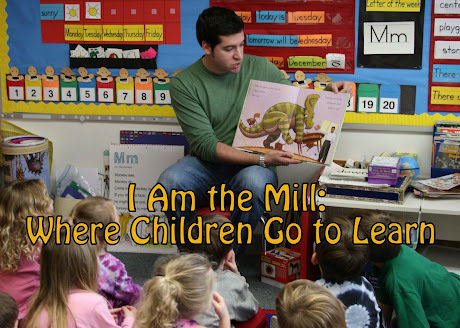 Also, each of the people whom you refer will receive a virtual hug from The Mill. This virtual hug will be fully clothed and purely platonic, so feel free to refer wives, girlfriends, husbands, boyfriends, sisters, brothers and grandparents. I do not discriminate. I'll post results next week, on November 26th. If this succeeds, I'll be giving away a Hummer H2 next time! Or perhaps another t-shirt! wouldn't it be a better idea to give out shirts with your blog web address to all of your friends as advertising for your blog? I'd give you a shirt with the website address, if you would wear it. Admittedly though, my URL is a bit clunky looking. It wouldn't be as stylish or as sleek as my current designs. Plus, I don't really have all that many friends. that's what the back of shirts are for -- clunky URLs. sign me up for a shirt please. Scott, did I miss out on this contest? I wish I had known. 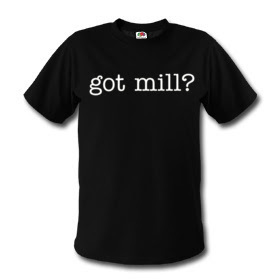 Do you have a shirt that says "Just Mill-ing?" Is Lindsay making the shirts for you? Will we see them in A&F or Hollister? Can I get one and use it for a Bat Mitzvah gift, thus making a subliminal statement? Pam, you're in luck. The contest is still running, although it would seem as though no one else realizes that. The shirt can say whatever you want it to say, but Abercrombie will not be seeing one red cent from me. The Bat Mitzvah gift idea is fabulous. I've always just assumed that 13 year old girls would be big fans of my blog. Fear not,my cousin. I teach 5 classes of 12 and 13 year olds!!! What a wonderful idea for a "friendly letter" assignment. We go back to school on Tuesday! If I can't get computer lab time, I'll let them use my computer. One kid at a time. .....is adding a comment so that she might win a t-shirt. May your blog live forever!!!!!! Ok..so I'm suppose to write a comment so Dennis could get a free t-shirt. Hope this helps.